Education once again is a priority for the programming committee, with a continued focus on what’s new in the world of diecutting, diemaking, folding cartons, foil and engraving. Many of the educational programs will take place in the Techshop™, offering attendees a one-of-a-kind experience with live, operating equipment available for informative programs and hands-on teaching. 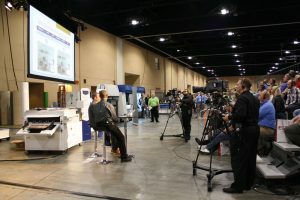 The Odyssey’s Techshop™ environment simulates a working production shop floor where technical sessions on diecutting, diemaking, folding/gluing, foil stamping/embossing and other print finishing processes are taught on-press throughout the three-day event. Live-action feeds allow attendees to see all action on the presses up close and in real time. For more details on the programs and educational opportunities at Odyssey Expo, check out the Program Matrix and Session List.